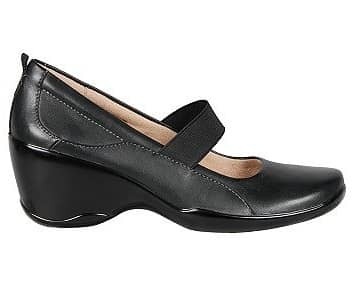 Add effortless style to your corporate or casual looks with the Naturalizer League Mary Janes. Leather upper in a casual Mary Jane style with a round toe. Elastic Mary Jane strap for easy and comfortable fit. Features N5 Comfort Elements, non-slip outsole. 1 3/4 inch wedge heel.